[160 Pages Report] The overall telecom cloud market is expected to grow from USD 9.46 billion in 2015 to USD 30.79 billion by 2021, at a CAGR of 23.0% from 2016 to 2021. The adoption of telecom cloud among enterprises has increased, due to benefits such as economics of scale, cost effectiveness, scalability, assistance in strategic decision-making, improved productivity & performance, flexibility, faster time-to-market, better control of critical applications, and decrease in business downtime & losses. The telecom offers enterprises, the flexibility to manage the resource consumption depending on business requirements. The base year considered for the study is 2015, and the forecast has been provided for the period between 2016 and 2021. In today’s unrestrained marketplace, telecom operators face unprecedented challenges, as they struggle to generate more revenues and improve the operational efficiency. Cost management has become an inherent core competence for wireless operators. Telecom operators always struggle to keep Operational Expenses (OPEX) in check with the available resource tracking methods. New technologies, such as Voice over Internet Protocol (VoIP) and OTT content emerge at a high pace and the operational costs increase exponentially to cater to these technologies. Owing to this, network operators are moving towards cost effective ways of doing business to reduce operational costs. The deployment of telecom cloud solutions helps telecom operators reduce the overall operational costs, as well as, the administration costs and provide simplified solutions. Telecom cloud is hosted on cloud platform, which offers flexible pricing for products & services and allows managing various types of revenues without constraints. During this research study, major players operating in the telecom cloud market in various regions have been identified, and their offerings, regional presence, and distribution channels have been analyzed through in-depth discussions. Top-down and bottom-up approaches have been used to determine the overall market size. Sizes of the other individual markets have been estimated using the percentage splits obtained through secondary sources such as D&B Hoovers, Bloomberg Businessweek, Let’s Talk Payments, CoinDesk, EconoTimes, and Factiva, along with primary respondents. The entire procedure includes the study of the annual and financial reports of the top market players and extensive interviews with industry experts such as CEOs, VPs, directors, and marketing executives for key insights (both qualitative and quantitative) pertaining to the market. The figure below shows the breakdown of the primaries on the basis of the company type, designation, and region considered during the research study. The telecom cloud market comprises a network of players which are AT&T Inc. (US), BT Group Plc (UK), Verizon Communications Inc. (US), Level 3 Communications, Inc. (US), CenturyLink, Inc. (US), Singapore Telecommunications Limited (Singapore), NTT Communications Corporation (Japan), and Orange Business Services (France). In December 2016, BT and T-Systems signed an agreement focused on the delivery of cloud services for SAP solutions. This partnership enabled BT to connect its customers to T-Systems’ data centers hosting SAP cloud capability via BT Cloud Connect that provides high performance and secure network connectivity to cloud services. In December 2016, AT&T introduced a new product ECOMP, a software platform that automates the onboarding, service chaining, management, and maintenance of the Virtual Network Functions (VNFs) and delivers these solutions within the AT&T Integrated Cloud. ECOMP supports AT&T FlexWare to power its speed and agility. In June 2016, CenturyLink acquired certain strategic assets of Active Broadband Networks, a provider in software-based broadband networking. These assets helped accelerate CenturyLink's efforts to automate its network, move network functions into the cloud, and deliver SDN and Network Functions Virtualization (NFV) services to its customers. What are new application areas which the telecom cloud companies are exploring? The overall telecom cloud market is expected to grow from USD 10.92 billion in 2016 to USD 30.79 billion by 2021 at a CAGR of 23.0%. 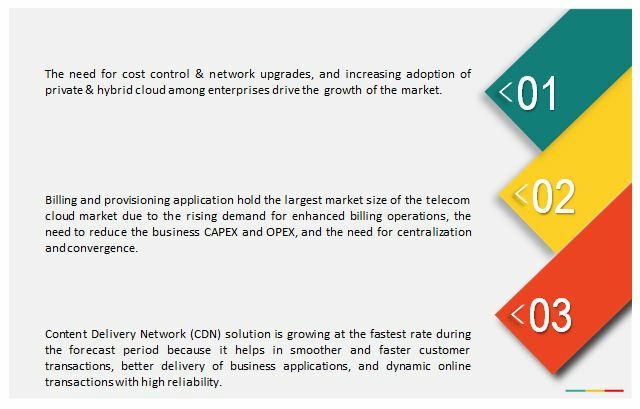 The major drivers of this market include need for lower operational & administration costs and the increasing awareness about telecom cloud among enterprises. The telecommunication industry is evolving the architecture of its networks and services to unleash the full value of cloud. More and more customers have quit from using landlines, which impacts the telecom sector. The shift to cloud services allow telecom providers to repurpose underexploited networking resources and take advantage of existing business relationships. Cloud is an integration of software and technologies that regulates cloud operations & automation, enabling optimal working of cloud computing based resources. Network operators must consider cloud computing as an integral part of their strategies, as they shift from selling communication services to servicing on-demand ICT capabilities. The telecom cloud offers enterprises, the flexibility to manage the resource consumption depending on business requirements. The adoption of telecom cloud among enterprises has increased, due to benefits such as economics of scale, cost effectiveness, scalability, assistance in strategic decision-making, improved productivity & performance, flexibility, faster time-to-market, better control of critical applications, and decrease in business downtime & losses. 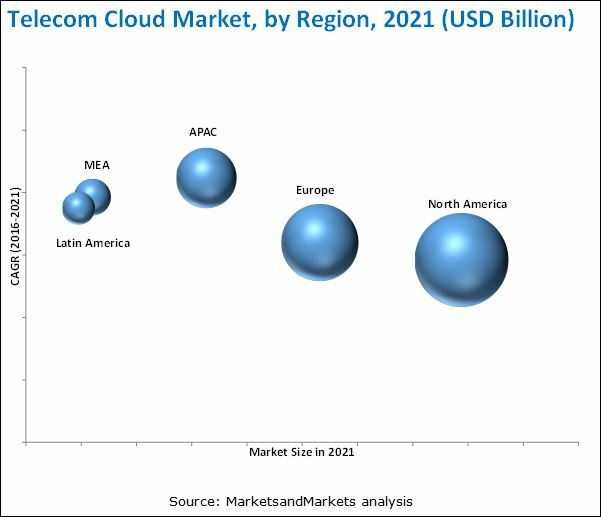 The telecom cloud market has been segmented on the basis of solutions into Unified Communication and Collaboration (UCC), Content Delivery Network (CDN), and others. On the basis of services, it is segmented into colocation service, network service, and professional services & managed services. On the basis of applications, it is further segmented into billing & provisioning, traffic management, and others. On the basis of deployment models, it has been segmented into public, private, and hybrid cloud. On the basis of organizational sizes, it is segmented into Small and Medium Enterprises (SMEs) and large enterprises. On the basis of verticals, it has been classified into Banking, Financial Services, & Insurance (BFSI), retail & consumer goods, government & public sectors, healthcare & life sciences, media & entertainment, and others. On the basis of regions, it has been divided into North America, Europe, APAC, MEA, and Latin America. The telecom cloud market in APAC is expected to grow at the highest CAGR during the forecast period. APAC is the fastest-growing market for telecom cloud. The increasing adoption of telecom cloud solutions in this region is due to technological advancements, along with mandatory regulations imposed by government regulatory entities to adopt the best-in-class technology and standards. As a result, APAC holds a significant share of the overall telecom cloud market. Cloud billing and provisioning is witnessing high growth in every sector due to the rising demand for enhanced billing operations, the need to reduce the business CAPEX and OPEX, and the need for centralization and convergence. The traditional billing process was complex and required lots of resources and time; therefore, to avoid these drawbacks, TSPs are providing cloud billing and provisioning solutions and services that eliminate the need to manage the operations manually, further resulting in revenue optimization. Moreover, the existing competition and global economic situation has accelerated the adoption of cost effective measures to restructure the business models. Cloud technology further reduces the integration costs, expensive hardware requirement, and avoids vendor locking. The billing solutions offered by the TSPs on cloud results in low CAPEX and OPEX as it eliminates the costs involved in the manual billing processes. Traffic management refers to the set of traffic control systems within the network that helps in regulating the traffic flow. This helps in maintaining the network flow during the time of congestion. Data networks are not just carrying volumes of internet traffic and cloud services, but also carry different kinds of traffic that might give rise to congestion in the network, thus making it difficult for the application and service to perform. To address these issues, TSPs are providing network management platforms, fault detection, and notification solutions. This helps in detecting faults in the network infrastructure and resolve the issues. Along with this, effective fault management systems help in alerting the network management station when the fault occurs, to take immediate corrective measures. Other applications include customer management and load balancing. Customer Management or Customer Relationship Management (CRM) refers to strategies and practices to analyze and manage customer data as well as interactions with the goal of improving customer relationship and retaining customers. Cloud-based solutions and services help organizations in collaboration and integration to better understand customers. Cloud helps in keeping track of the real-time information and helps organizations to take real-time decisions. Thus, TSPs provide various services to cater to a number of customer management applications. What are the upcoming industry applications for telecom cloud? Telecom regulations benefit some telecom operators and could impose limitations over the other operators. Regulatory actions and threats to force incumbents for sharing new access to infrastructure inhibits investment in new infrastructure and delays system deployment. These regulations over new investments dampen telecom software spending over new technologies. The regulatory impact is considered to be the greatest in Western Europe, due to the differences in regulations in various countries in this region. Regulations, which are intended to protect the customer data and also sharing of the subscriber information are considered to be one of the most significant factors in restricting the adoption of the overall telecom cloud market. Key players in the market include AT&T Inc. (US), BT Group Plc (UK), Verizon Communications Inc. (US), Level 3 Communications, Inc. (US), CenturyLink, Inc. (US), Singapore Telecommunications Limited (Singapore), NTT Communications Corporation (Japan), and Orange Business Services (France). These players are increasingly undertaking mergers and acquisitions, and product launches to develop and introduce new technologies and products in the market. 14.5 Level 3 Communications, Inc.
15.1 Fusion Telecommunications International, Inc.
15.5 Global It Communications, Inc.